Unfortunately, no one in this world can ever be completely safe from life’s dangers. However, it is within our power to find out beforehand how we should act if we find ourselves in an extreme situation. In fact, timely action in such a situation could save both your own and other people’s lives. 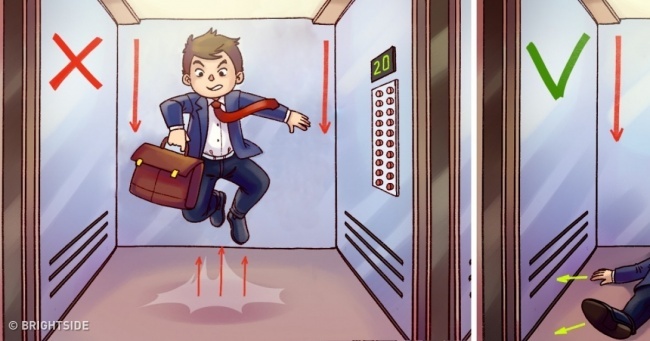 We would like to share with you the recommendations of scientists and engineers about what you should and what you definitely shouldn’t do if you find yourself in a falling elevator. Firstly, it will be very difficult to jump when you’re in freefall. Secondly, your jump will reduce the speed of your fall by the same amount that it’s occurring, and this is bad news for most people. Thirdly, there’s no way to predict which part of your body you’ll land on, and therefore what harm jumping will do to your body. The guys over at the Discovery Channel have long since proved that you should never do this — see this video. This also isn’t a good idea, since a weight that is ten times greater than that of your body is going to come down on your legs during the fall. This could lead to extremely serious injuries. As soon as you feel that the elevator is falling, immediately lie on your back on the floor of the elevator. In this position, the strength of the blow will be spread equally across the area of your body. In this situation, the best thing you can do is sit on the floor of the elevator. In this position, the load on your skeleton will be less than if you were standing. If there’s very little space, then at least try to bend your knees, as this will also help to reduce the force of the impact.